The first Grand Prix at the Marina Bay Street Circuit was held in 2008 and it quickly became very popular among the fans and in the region of Asia. People from neighboring countries buy tickets to go and watch the Formula One cars buzzing through the street circuit. Now let’s take a look at the track itself. The track length is 5.065 km. Number of laps is 61. Pirelli have given the tyre selection between the Super Soft and the Soft compound tyres. It is a twisty circuit that is the slowest in Formula One running at normal race distance above 305 kilometers (190 mi), which combined with its features of proximity to walls leads to frequent safety cars, further extending the running to upwards of two hours. The bumpiness, the heavy braking zones, the lack of daylight and the humidity makes the race very testing for both drivers and cars. It has some 90-degree turns, but is pretty variable in that aspect, featuring technical sections with quick direction changes as well. 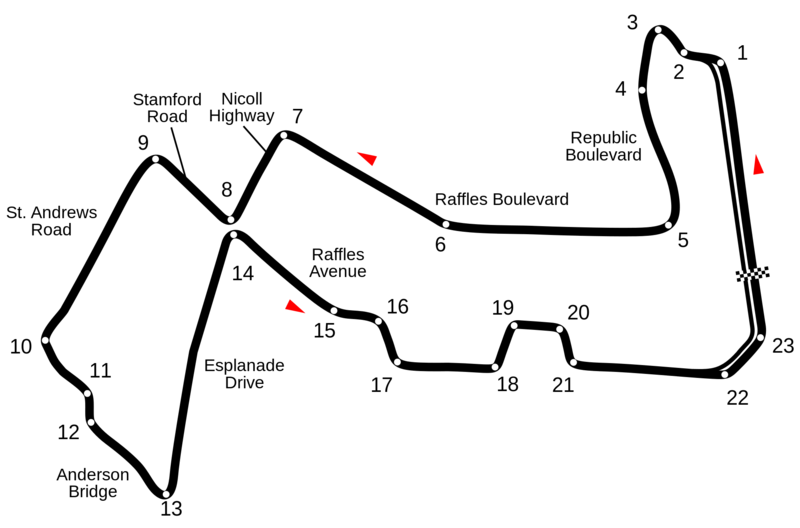 Overtaking is primarily done at the end of the first sector, where top speeds are at their highest. Runoff areas exist at the end of the long straightaways, but are very short by Formula One standards. At most parts of the track, cars run very close to the walls. With Hamilton blazing the whole pack this season, expect dominance from the Mercedes driver for this race. But still, being how unpredictable the sport is, anything can happen. Make sure to catch the race this Sunday! Enjoy the race weekend!